Sometimes brunch seems like it’s the most snobbiest meal. It’s not necessary, unlike breakfast, it’s not as exciting as a dinner out on the town and it’s not as humble as my favorite: the afternoon snack. In fact, Josh and I often joke about how we hate the term, “let’s do brunch,” but my friend Seebs swears by it, and she knows her stuff. 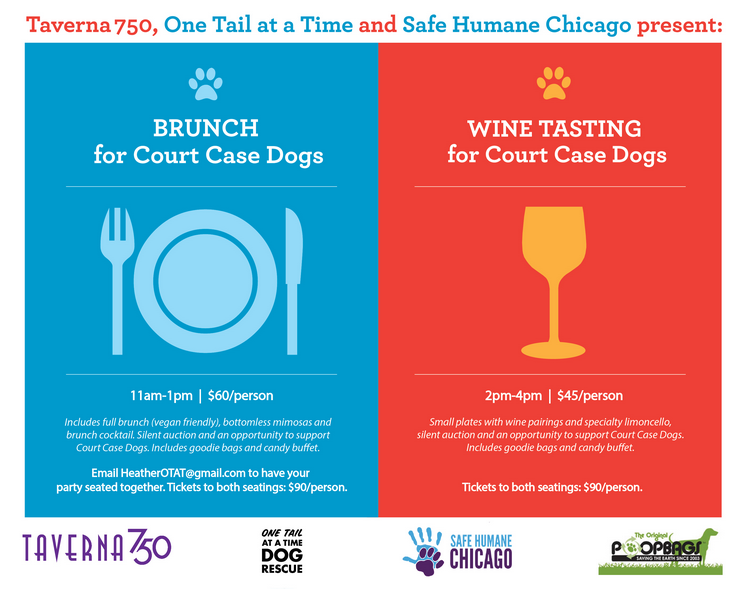 I’ve mentioned the court case dogs from Safe Humane Chicago before, and this time there’s brunch involved. One Tail at a Time, in conjunction with SHC and Taverna 750, is hosting a brunch and wine tasting to benefit these pups. Over the years, SHC has saved many, many pups from an otherwise cruel fate, and OTAT has taken in close to 20 of these dogs, all whom have since been adopted into loving homes. So if you’re in the Chicago area, come sip mimosas with us and nibble on tasty vegan treats. You can buy tickets right here. I would soooo go to both of those if I were in the area! So wish you could come! !